Twelve monkeys have been found dead as a result of heart attacks, not long after they were scared by a tiger. 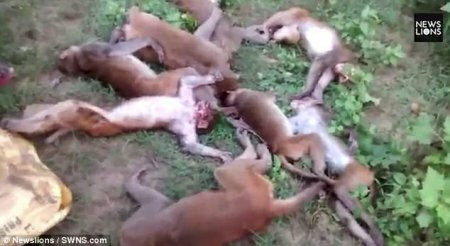 They were said to have been discovered by some forest department workers who were shocked by the apparent mass death in an Indian forest. Postmortem investigations carried out by vets in the Kotwali Mohammadi area of the northern Indian state of Uttar Pradesh revealed that they all had heart attacks at the same time. Vet Dr. Sanjeev Kumar said: ‘It was confirmed in the post-mortem report that the monkeys died due to cardiac arrest. According to him, Forest department workers found the monkeys on Monday. He said villagers reported that tigers are often in the area and were heard roaring at the time of the deaths. The claim of a mass heart attack has been criticized by wildlife experts, however, who suggest the animals were more likely to have died from an infection.